1. Heat oil or ghee in a pot. 2. Put fried urad dal and chana dal roast it for 5 minutes. 3. Then Roast red chilies and cashew nut, sev and cream of wheat (Rava). 4. Make buttermilk of plain yogurt and add it to the mixture of cream of wheat to form a soft batter. 5. Keep it covered for 5-6 hours. 6. Add green peas, chopped beans, green chili paste, salt and curry leaves. 7. Fill the moulds with the batter and cover it. 8. 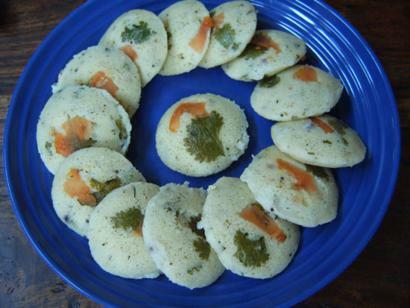 Steam the idli and serve with chutney and sambhar.